A Pen by Ryan Krusac | Inkdependence! 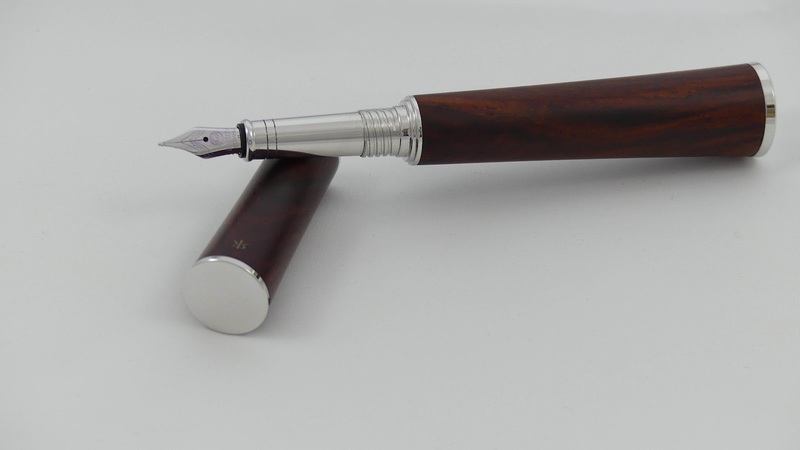 I didn't put this pen's name in the title because this model doesn't really have a name (you'll see one like it at the bottom of this link). It's design that I kept seeing at pen shows and I kept resisting. Then, at the end of the Raleigh show this year, I stopped resisting. 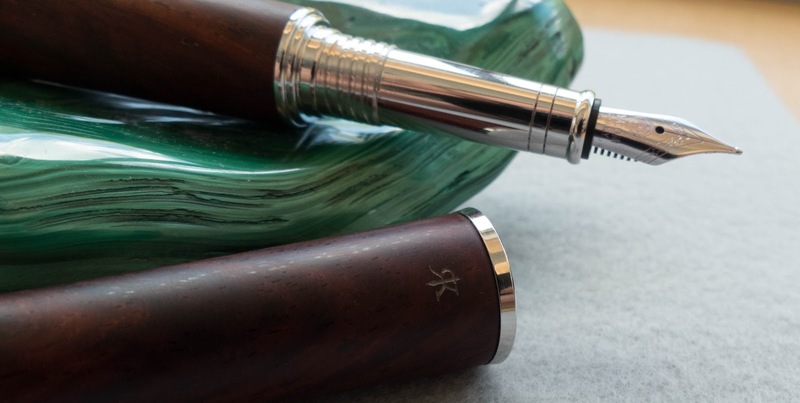 This cool, hour-glass-shaped pen is made from cocobolo wood. 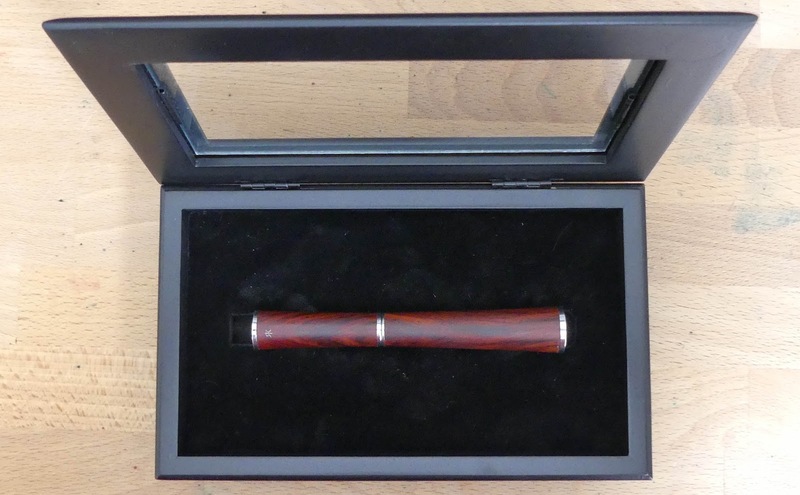 I don't think I've seen anything made of cocobolo that wasn't really beautiful. It's a reddish wood that tends to be very durable and swirly. Plus, it's a fun name to say. 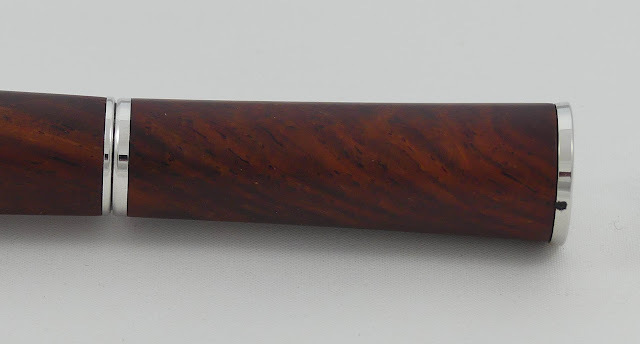 Try it out: "cocobolo." So, check out this awesome Ryan Krusac pen! 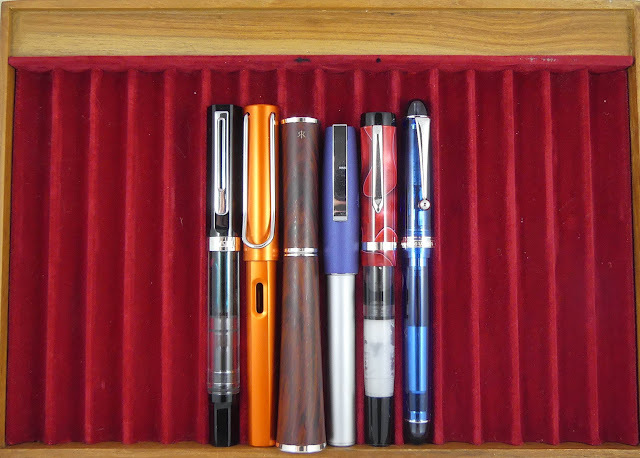 Ryan's pens come in these display cases. This sort of pen usually has a custom-carved hole in the foam to accommodate its unusual shape, but I got this one at a pen show, and it fits well enough in the slot that I didn't want to have him take the time to carve out the right shape. He offered, though. It's the only pen box that I've left out on my desk. In a word: beautiful. The wood is rich and reddish. It's very smooth to the touch but not slippery at all. the asymmetry of the design is really pleasing to my eye, and the chrome ends and waist break it up beautifully. The section is metal, and it slopes down from the top to the bottom of the section. You can see the threads on the section there, but they're shallow and flat. Even if you grip on the threads, they hardly feel like they're there. A metal section is a no-no for lots of people, but the extra weight of the barrel and the width of that barrel really help to keep the section in my fingers. Anyway, it doesn't feel slippery. 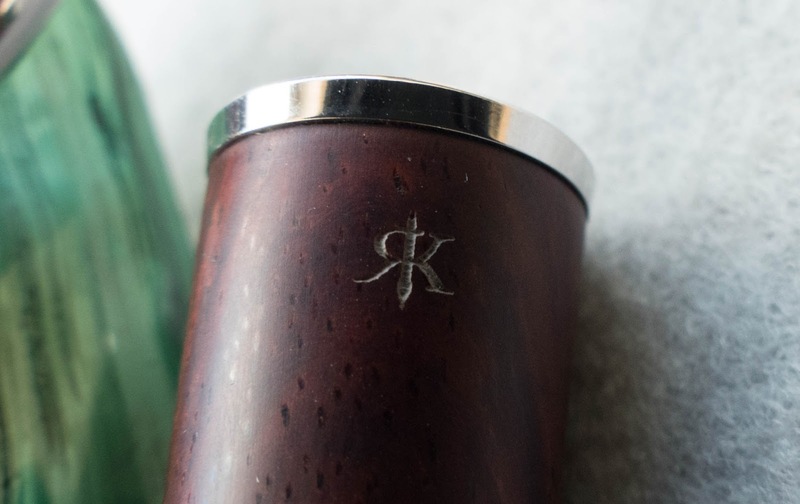 This is the only marking on the pen, and it's Ryan's logo. I love minimal branding. Here are all the of parts. It's pretty standard on the inside. Metal threads, so don't eyedropper it. 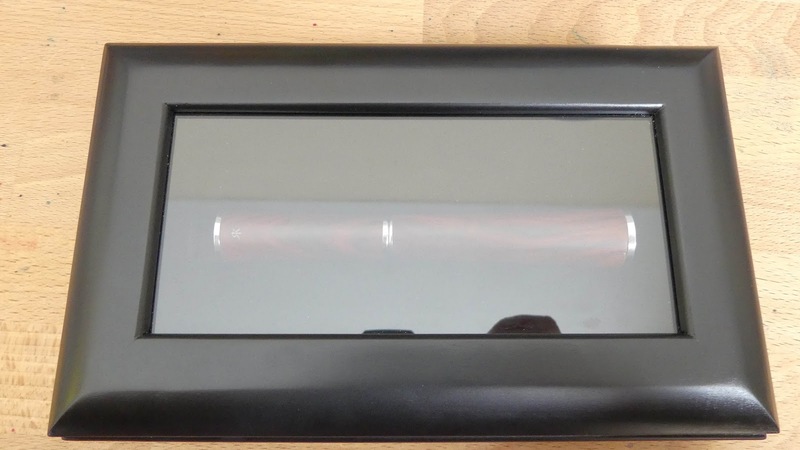 Also, I'm not sure that the inside of the pen is sealed, either, so you know. Don't do that. 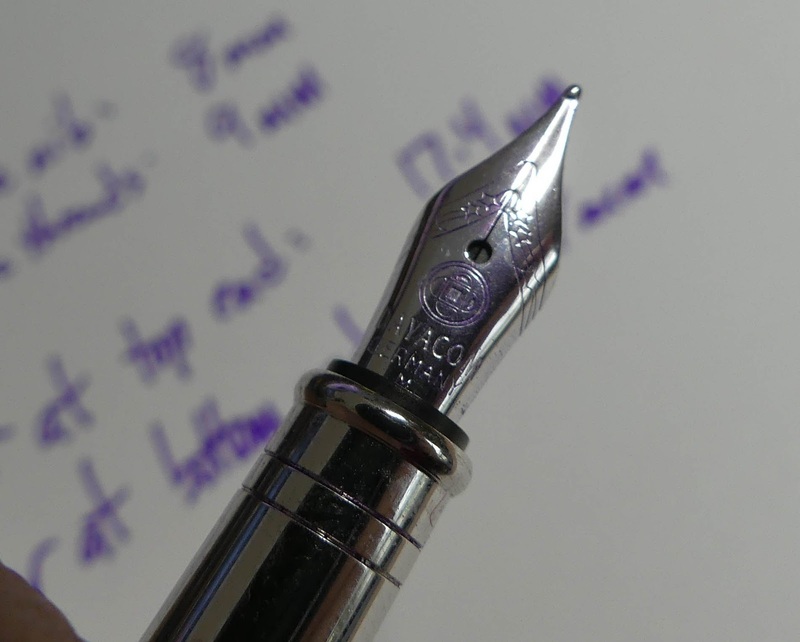 It's a Dayacom nib, which I'm not familiar with. I don't thin I saw this nib on his other pens at the last show, so he may get the nibs from some other vendor or he may just be customizing the ones that he gets from Dayacom. I don't know the answer to that one. 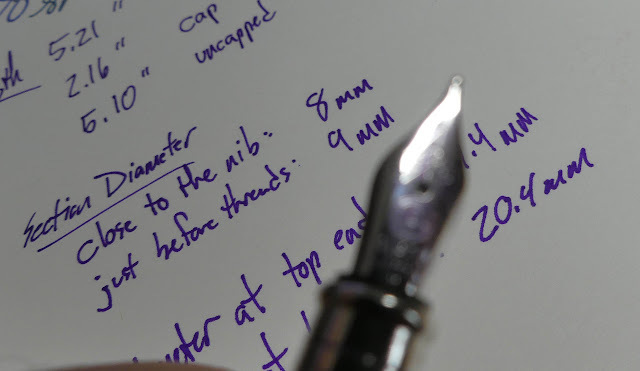 Anyway, it's a smooth nib that never fails to start. I've actually had the same ink in this pen for a few months, but it's never dried out or evaporated, so the cap must have a really solid seal on it. Check out the video review for a live writing sample. It's pretty great in the hand. It's weighty without being heavy. The nib glides. The wider end of the pen fits really well in the web of my hand. 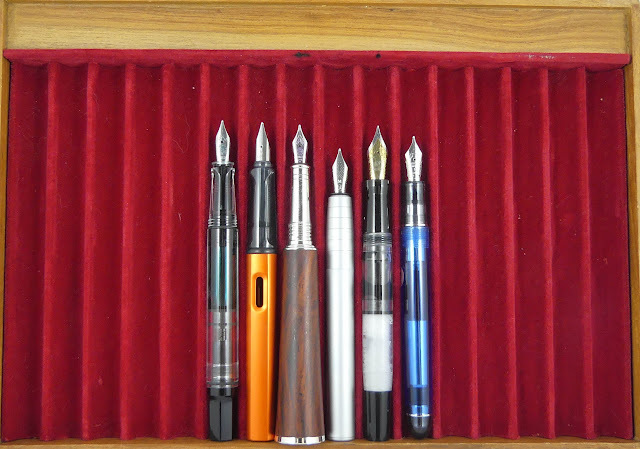 From left to right: TWSBI Eco, Lamy Al-Star, Krusac, Faber-Castell Loom, Bexley Phoenix, Pilot Custom 74. You can't post this pen, so I didn't bother with a posted comparison shot. 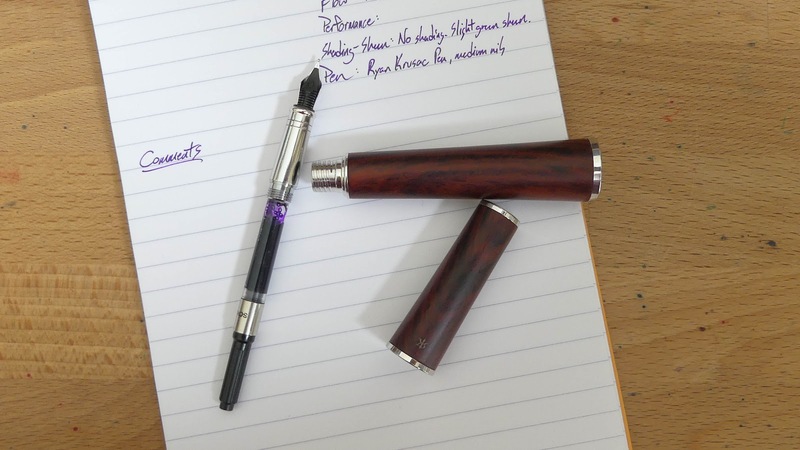 This pen is pretty much the same length as the most popular pens out there, though it's going to be heavier in the hand than either the Eco or the Al-Star. I really like this pen. It's beautiful to look at, it feels nice in the hand, and it writes every time. What more can you want? 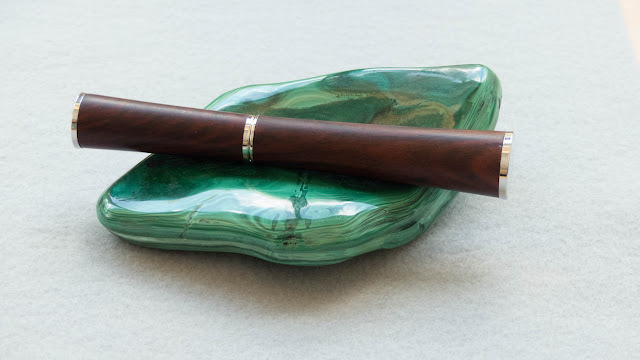 Wow - I love the way this pen looks capped. When I see it uncapped, well, the impression isn't as striking as I don't really like the way this section looks. Yeah, I get that. It's certainly more attractive when it's capped. Doesn't keep me from loving it, though.